Indonesia said Saturday it supported Libya's peaceful transition towards democracy following the downfall of Moamer Kadhafi. "Indonesia supports the National Transitional Council in Libya in carrying out the peaceful transition towards democracy," Indonesian Foreign Minister Marty Natalegawa said in a statement. Natalegawa said the process of the democratic transition must reflect the wishes and aspirations of Libyans. "In the end, a political process which grants Libyans the chance to decide their own future is the best solution in resolving the issues in Libya," he said. United Nations Secretary-General Ban Ki-moon Saturday urged all nations to help stabilise Libya but said the future of the country should be decided by its own people. "I continue to urge all countries to come together to help the Libyan people," he told a press conference in Canberra. NTC fighters waving the newly adopted Libyan flag, as women (unseen) gather in Marty's Square in the capital Tripoli during a rally on the third and last day of Eid al-Fitr which marks the end of the Muslim holy month of Ramadan, on September 2, 2011. Libya's new leaders said Friday they will move to Tripoli next week after their forces defeated Moamer Kadhafi and they won wide international support for plans to bring democratic rule. "We will go to Tripoli next week. Tripoli is our capital," National Transitional Council (NTC) chairman Mustafa Abdel Jalil told dignitaries and tribesmen in the eastern city of Benghazi. Three days after overrunning Tripoli, the NTC announced on August 26 plans to transfer its executive branch to the Libyan capital, but said the whole of the council and its chair would only move once security was guaranteed. Abdel Jalil's statement came after fallen strongman Kadhafi warned of a lengthy and widespread guerrilla war in messages broadcast from his unknown hideout. In Tripoli, thousands of people, most of them women, gathered in Martyrs' Square in a show of support for the new leadership, also raising US and French flags while mocking Kadhafi by wearing curly wigs. "We will win or we will die" and "Libya is one and united," read their banners. Bolstered by promises made at a conference in Paris on Thursday of billions of dollars in cash from unfrozen assets of the Kadhafi regime, the NTC prepared to implement a roadmap for bringing democracy to Libya. A body tasked with drafting a constitution should be elected within eight months and a government within 20 months, NTC representative in Britain Guma al-Gamaty told the BBC on Friday. For the first eight months the NTC would lead Libya, during which a council of about 200 people should have been directly elected, Gamaty said, referring to plans drawn up in March and refined last month. "This council... will take over and oversee the drafting of a democratic constitution, that should be debated and then brought to a referendum," he said. Within a year of the council being installed, final parliamentary and presidential elections should be held. The new leadership was also boosted on the economic front, with the weekly Middle East Economic Survey reporting Libya could at least partially resume crude oil output and refining within days. Quoting local officials, MEES added however that the country would take time to reach its pre-war oil production level of 1.7 million barrels per day (bpd). Interim interior and security minister Ahmed Darrad said in Tripoli on Friday that fighters from elsewhere who had helped to liberate the capital should now go home. "Starting Saturday there will be a large number of security personnel and policemen who will go back to work," he told AFP. "Now the revolutionaries of Tripoli are able to protect their own city." 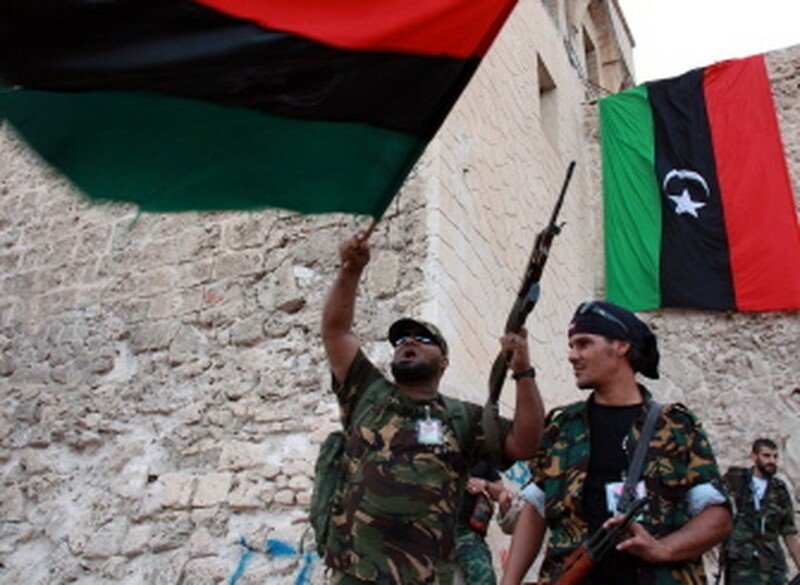 The demand aims at defusing possible tensions between Tripoli's freshly emerged revolutionaries and the scores of hardened fighters who poured in from other towns to topple Kadhafi's regime. "We are grateful for the work of brigades from Misrata, Zintan and elsewhere, but as soon as we finish organising our own ranks they should go and rest." said Abdullah Naqir, head of the newly formed military council of Tripoli. Senior envoys from more than 60 countries met the leaders of the NTC in Paris to endorse the fledgling new regime and offer practical support. Even once sceptical Russia and China and Libya's reluctant neighbour Algeria agreed to back the new administration. French President Nicolas Sarkozy, the uprising's most prominent supporter from the outset in February, said around $15 billion had already been unfrozen and more would follow. Sarkozy and other leaders urged the NTC to begin a "process of reconciliation and forgiveness." Abdel Jalil said Libyans had "proved their courage and their determination" in their fight to topple Kadhafi, and it was now up to them to bring about the promised stability, peace and reconciliation. Kadhafi, however, was having nothing of it. "Prepare yourselves for a gang and guerrilla war, for urban warfare and popular resistance in every town... to defeat the enemy everywhere," he warned in one of two audio tapes aired on Arab satellite television late on Thursday. "If they want a long battle, let it be long. If Libya burns, who will be able to govern it? Let it burn," he said on the 42nd anniversary of his coup that toppled the monarchy and seized power. His foes say Kadhafi and his son Seif al-Islam may be in Bani Walid, southeast of the capital and still held by loyalist troops, where some clashes have taken place. But the NTC has put its assault on the centres still controlled by pro-Kadhafi forces, in particular his hometown of Sirte, on hold until September 10 to try to negotiate a peaceful end to the six-and-a-half month conflict. East and west of Sirte, the attackers have halted their advance while talks with tribal leaders go on, but at the same time they are preparing for an assault. In Qum Qandil, west of Sirte, where reinforcements have been pouring in, fighters carefully checked their heavy machine-guns and rifles, loading shells into clips ready for use. Tanks, mortars and heavy artillery have also been deployed among the sand dunes behind the frontline, ready for an opening barrage, but on Friday all was quiet.